There is no questioning on the benefits of a tank water change and how it ensures the health of all the living things in your aquarium. There is however much debate among goldfish owners about how much water should be changed during these routine water change and what makes for the best care. Practice #1: Only replacing the evaporated water from your tank is not recommended and should be avoided. When water evaporates and lowers the water level in your goldfish’s aquarium or pond, it leaves behind the heavier pollutants. If you only replace the evaporated water, over time these pollutants can make your water denser and build to unhealthy levels. To explain this effect more clearly, you may notice residue lines on the sides of your aquarium glass. Those lines are the remnants of what is left behind when your tank water evaporates. Practice #2: A partial water change consist of removing about 20-75% of the water in your aquarium. You can use an aquarium siphon to help remove the dirt and debris from the gravel and a net to gather up the floating debris. You may choose to place your fish into a temporary tank to avoid injuring them or stressing them out while you clean. After the water is replaced, you need to add a water conditioner to remove any chlorine from the tap water. Practice #3:A complete water change can use the same techniques to remove dirt and debris until all the water is removed. Of course in this situation, you would have to place your fish into a temporary tank. And like in the partial change, a water conditioner is needed. Both methods are acceptable practices but not without some debate. The main argument in opposition of a complete or large percentage water change is that you should not change all the water in your tank in one cleaning because it will change the chemistry of the water too much and will stress or kill your fish. The main argument in favor of a large change is that you don’t eliminate all the waste in your goldfish tank with a partial water change and over time the waste levels can build to unhealthy levels. Both schools of thought are correct. Both can cause problems for your goldfish and both stress the importance of having fresh clean water in your aquarium or pond – So what do you do? Most advice found on the internet says to change at least 20-30% and to never change 100% of the water during routine maintenance. 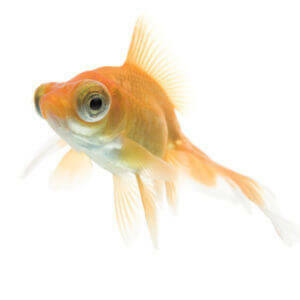 If you do 20-30% water changes, your waste levels will build up but likely won’t kill your goldfish. They would of course be happier with even more clean water so if you are feeling guilty, up your tank water change to 50-75%. This will eliminate much more waste and by leaving some water in goldfish aquarium, will not drastically change the chemistry of the water. Water is very dirty..i had two goldfish in a fish bowl..i did a 50% water change using poland spring, which ive used everytime, never a problem. This time around after the change one of my fish died..the water is still very dirty and i;m afraid for my other goldfish.. Should i risk it and do another change. Keep in mind i got these guys unexpectedly so i dont have a fliter nor a water cond. Hi I need some advice I have a 10 gallon tank and one gold fish that has been though a lot bc I got him unexpectedly and he had to go through the cycle of the tank. Now the tank is pretty much cycled the ammonia nitrites are low and the nitrates are going up. I have not changed the water in two weeks I stopped bc every time I tried to change it the fish would seriously freak out! I took my tap water to be tested and found out it has a lot of ammonia in it! I have prime and was treating the water with prime but now I’m really afraid to add the water even with prime and the worst part is two weeks ago when I was attempting a water change I took some water out and have not put any back in so I really feel like I should refill it! I’m just afraid to! Could someone please tell me what I need to do! My fish does not look very good! Hi I have a 55 gallon tank with three medium gold fish and one zebra danio. I have notice that my three gold fish are not very active and are mostly on the bottom. I went to a pet store for a test water,they told me that the nitrates are very high. They recommended me to do a 30%of water change once a week. I did a water chance yesterday but they are still not that active. Do I need to do Another water chance,need help!! I don’t want my fish to die. Yes do another water change. I would consider a larger water change next time around. Hi Claudia it can possible that they have some degistive problem u can give them 2 or 3 peas by taking out the cover(shell) making 10 to 15 small pieces of one pea will better n u will see within 24 hr ur fish will b ok n will b better if u do a 70 to 80% of water change after Avery 15 to 20 days n feed ur fish a less food but 2 to 3 times a day n Dnt worry goldies can die by over feeding I will say under feeding is better than over feeding I do have 3 goldies one fantail n 2 oranda i feed them one day blood worms one day normal gold fish food n third day peas I follow this schedule twice a week n once a week i Dnt feed them at all this may looks like cruelty but trust me it’s keep there system better but I feed them less but at least twice or thrice a day as gold fish Dnt have stomach they easily get overfeed . That’s good advice on removing waste from your tank.